Atlas Obscura meets 1001 Facts to Scare the Sh*t Out of You in this serious survey of the most bizarre, creepy, and sometimes hilarious customs from cultures around the world. Every culture handles life differently. From the “blackening of the bride” in Scotland and the custom of not looking babies in the eyes in Kenya, to enlisting geese as part of the police squad in China and the tradition of children eating bread with chocolate sprinkles for breakfast in Amsterdam, there are so many unique behaviors all across the world. 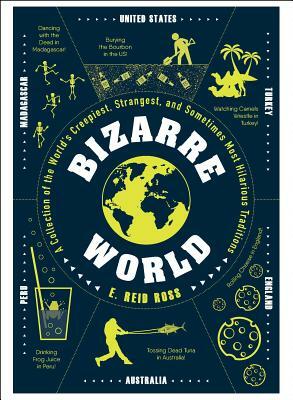 In Bizarre World, journey across the globe to understand how various cultures approach everything from grief, beauty standards, food, parenting, death, stress management, happiness, and more. Many customs may seem perfectly sane, while others, not so much. Some are just downright strange, funny, or weird. E. Reid Ross resides in Maryland and is a columnist/editor at Cracked. He’s no scientist, that’s for sure, but with a background in military intelligence and law enforcement, he’s not just the author this book needs, he’s exactly the one it deserves.